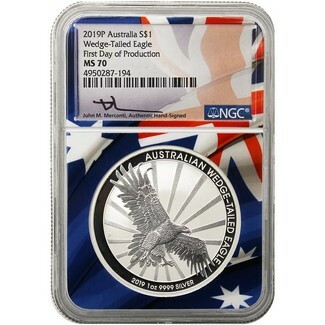 2019 marks the 6th Anniversary of John Mercanti's Wedge Tailed Eagle; struck at the Perth Mint. This 1oz .9999 silver coin has a mintage of just 50,000 and arrives in a Perth Mint presentation case. But of that mintage, only 987 coins were struck on the First Day of Production. NGC has certified this coin in perfect MS70 condition and arrives in their Australian Flag Core holder with the label hand signed by John Mercanti.